If you’ve followed my online ministry for any length of time you’ve come to realize that I am bold in some of my topics of discussion. From dating to how to handle feeling isolated I try my best to speak about topics that pertain to today’s Christian women. But whether you’re a woman of God or a woman who has no affiliation with Christianity living with painful menstrual cycles or periods can affect any one of us. I felt compelled to write this post after hearing yet again another young woman talk about her painful cycles and how a birth control implant was “suppose” to help regulate her hormones. If you would like to learn more about how I finally got relief keep reading. I’m not afraid to say that this January 2018 I turned 37 years old and I’m almost 15 wks pregnant. I thank God He has given me nearly 40 years on this earth and healed my infertility. Unfortunately, from the age of 16 up until I was 35.5 years old my periods were horrible. Basically, for 20 years I dreaded when AF (Aunt Flow or period) came to visit. I remember my cramps being so bad that I often left school or work early because I couldn’t function. My cramps were crippling. The worst part of my experience was that I didn’t have terrible cramps every month. Some months I could get by with taking just one or two Motrin and other months NOTHING other than time would make the pain go away. The fact that my excruciating periods came sporadically left me on edge each and every month. I used to ask myself right before I knew AF was coming is this month going to be one of those horrible episodes? I basically lived in fear that I may have a traumatizing episode at any place and at any time. I tried my best to plan my day around the start of my period. I didn’t have control over my periods my periods controlled me. This was no way to live. I want to tell you that PMS is not normal. We women have become accustomed to the PMS jokes and have accepted that it’s just a part of the whole experience. 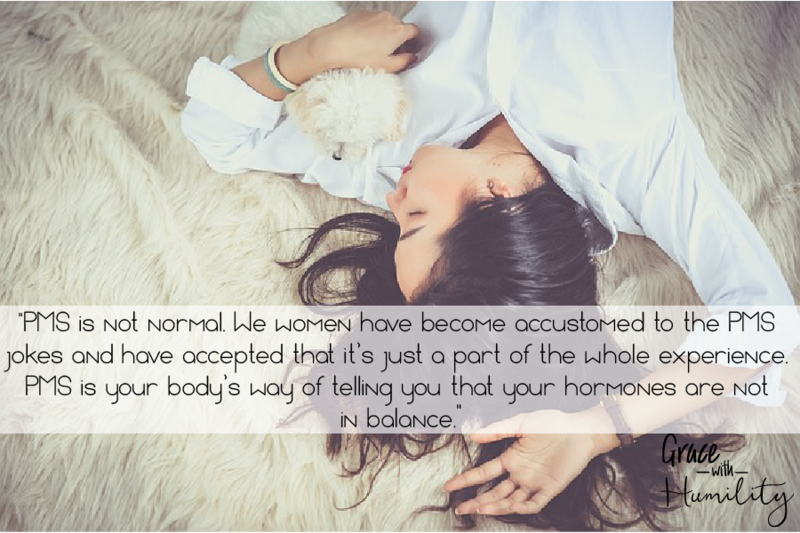 PMS is your body’s way of telling you that your hormones are not in balance. This explains why many doctors either prescribe medicines that counteract the PMS or suggest women go on the pill to help balance their hormones. These are synthetic solutions that may have unfavorable long term side effects. My college roommate’s sister took so much Motrin over the years that the medication no longer had an effect on her debilitating cramps and caused her to have gastritis. Also, if you are experiencing irregular periods, heavy bleeding, painful cramps, quarter size blood clots, vomiting, weakness, low iron, spotting in between cycles, or very light periods PLEASE consult a physician. There are multiple causes for these symptoms that may include PCOS, Endometriosis, fibroids, large cysts, some forms of uterine cancer, thyroid issues, infertility issues, etc. The sooner you know what’s going on the sooner you can intervene and get better. I was prescribed birth control pills a few times to help with my Dysmenorrhea (painful periods) and once to dissolve a gulf ball cyst. And yes, sometimes it did help, but I couldn’t stop wondering about the long term consequences for taking the pill to include having difficulties becoming pregnant when starting a family and becoming too dependent on the pill for pain relief. Despite knowing the repercussions for no longer taking the pill (the return of cramping), in February of 2013 I decided that the pill will no longer be my pain relief crutch. So, instead I turned back to pain medication as if it were any better for my body. At least I could start a family now, so I thought. 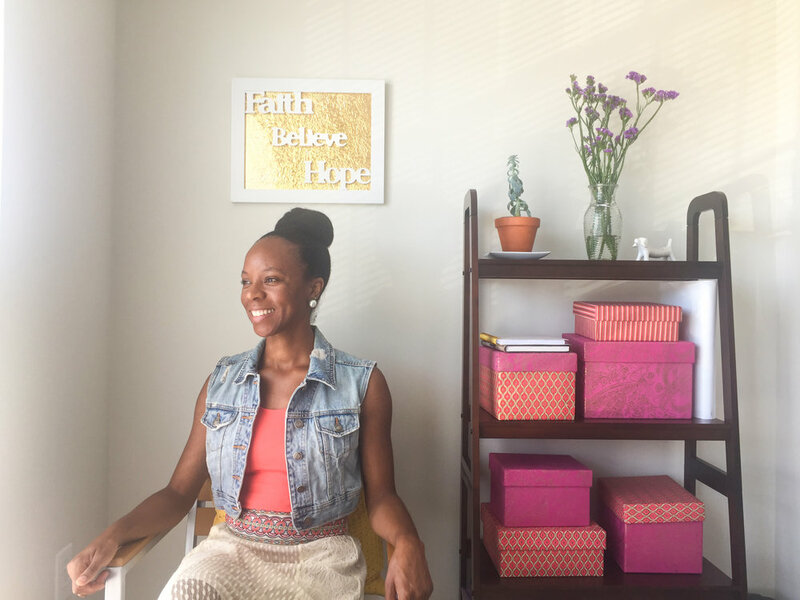 You can read all about my infertility struggles and how God healed me in future posts! I’m not going to judge those who believe in taking some form of birth control to help relieve painful menstrual cramps. I understand exactly how you feel. It’s for you to decide and not your doctor nor myself what route to take, but I’m here to share that there may be another alternative solution to your pain. If you are adamant about taking a form of birth control for your period discomfort please do thorough research about the particular method you plan to use. My doctor once prescribed a popular pill and after three months of taking it I asked my doctor to give me something else. The side effects I was experiencing didn’t sit well with me. God was definitely on my side because 2 years later that particular pill was deemed unsafe and pulled off the market. What finally helped me was changing my diet. There was no magic pill involved. After feeling as though God had cursed me because of my past sins I was desperate to find a solution to my severe menstrual pains. 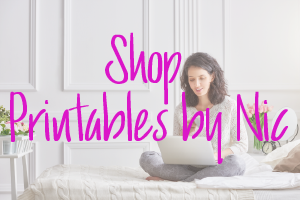 I read countless blog posts and medical articles as well as watched YouTube videos and read the comments searching for an answer outside of birth control and pain meds. What I realized is for some women diet played a huge role in their hormonal function. Women who ate a diet high in veggies and fruits suffered less while women who ate a standard American diet continued to complain about menstrual pain. So, to prove this theory I embarked on a journey to transition into a plant based diet. Not only did I decide to go this route to cure my painful menstrual cramps, but also to balance my hormones so I can conceive naturally. No way am I pushing a vegetarian or vegan diet, but I have to be honest with you and say only when I eliminated certain foods completely out of my diet did my pain subside substantially. Before my change in diet on a scale of 1-10 my cramping pain would average about an 8 each month and sometimes off the scale with a 12. Within 6 months or so of my experiment my menstrual discomfort dropped down to a 1 or 2. The worst I felt was a 3 and that was when I ate some junk food that wasn’t vegan friendly. I’m not going to promise you will be completely pain free. You are shedding your uterine lining you know, but you shouldn’t have to feel as though you are going into labor every month either. I’ve come to learn hormones found in dairy products like milk, cheese, yogurt, sour cream, certain non-organic meats like chicken can throw your body off and cause inflammation. Not only that but so much of our food is laced with soy which can also cause hormonal imbalance. After cutting dairy out of my diet I noticed I no longer get cystic acne. Hormonal imbalance plays a huge role in cystic acne so it made since that I no longer suffer from it since switching to a plant based diet. I also try to limit my intake of processed, white table sugar. What I found most interesting is that when I suffered from extreme menstrual cramps not one doctor recommended that I change my diet. Their answer to my problem was always birth control and pain meds. I find this to be travesty that so many doctors would rather push meds than to get to the root of the problem. I can also confirm that diet played a huge role when I noticed many of the women I’ve encountered who suffer from menstrual pains eat diets that contain dairy and or meat. In addition, they seem not to associate hormonal imbalance to high soy consumption. Now there are women who can consume dairy, meat, and soy that do not have painful periods – I find them to be anomalies, but on a larger scale most women who do eat this way dread their period every month. So what I am suppose to eat then, Nichole? Before I can give you recommendations let me first list the foods I eliminated from my diet. I am not a plant based food Nazi. Everyone has their own convictions and the worse thing I can do is force my personal beliefs and food recommendations on those who continue to eat animal products. What I WILL say is try your darndest to eat only organic animal products to lessen your exposure to unnecessary added steroids, hormones, and chemicals. I could share with you a list of the specific foods I now eat, but the list would be pretty long. I will simply say I eat a diet rich in fresh veggies, fruits, grains (rice, whole grains, oatmeal), potatoes, beans, nut butters, avocado oil (some may disagree), pasta, almond milk, and unrefined coconut sugar. To see if the foods I listed could be contributing to your menstrual struggles I recommend keeping a food diary for at least 6months. Make sure to document the foods you are currently avoiding as well as the food categories you are still consuming. Write down how you feel during that month’s cycle. I recommend taking each category one month at a time to prevent confusion as to which foods you are most sensitive to. Month 1 eliminate all dairy consumption. If by your next period you no longer have painful cramps then most likely dairy was a contributing factor. Just to make sure I would go another month without dairy for confirmation. If it’s confirmed then maybe you need to find dairy substitutes in your diet. Now if you eliminated dairy for a month and your cramps have not lessened then go onto month 2 and cut out the soy. If on your next period you no longer have cramps then go for another month without soy to confirm it is the culprit. Most likely in this case it is the soy products that you may want to cut out. Now, this is just an example of how you can pin point food sensitivities. If this approach doesn’t suit you just search the web for more guides. The bottom line is that you want to experiment with eliminating certain foods out of your diet and reintroducing them back in to discover the foods that are contributing to your hormonal imbalance. Once you narrow down your food intolerances you can make a sound decision to take back your health. It’s important to be under the care of a physician who requests lab results to make sure you are getting all of your necessary nutritional requirements if you decide to change your diet. It’s important to recognize the world we live in is no longer pure. When God created this world our food source was unadulterated, untouched by man. As commercialism and greed took precedents over integrity and morals our food sources have become our daily poisons. The vast majority of the food we eat, even veggies and fruits are laced with manmade chemicals and pesticides. When we grocery shop the average mainstream chains devote a small section to fresh product while making plenty of floor space for processed food that often times takes months to years to spoil. With full conviction I believe our poor food choices are behind the epidemic of infertility and hormonal imbalances we women face. I’m not saying you have to eat just like me, but even a small few changes can make the world of difference in your health. Have you suffered or are you currently suffering from painful menstrual cycles and if ]so, how do you cope each month?